An enticing offer, to be sure, but the amendment is just icing on the cake! 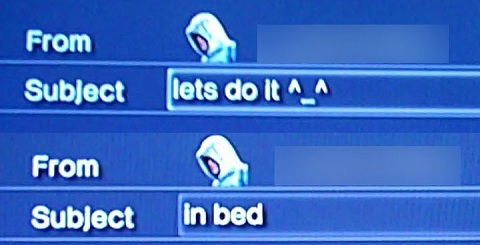 Look, I’m just saying, if Altair asked me to do it with him, I probably would. Ezio, for me. No doubt. In bed you say? You frisky biscuit you! I’ll grab my D20s and miniatures, you make the pillow fort! I probably would as well. Let’s do it, let’s fall in love… in my bed… even though I’m a total stranger. If you really wanna impress a fella, you bring the 100-sided! Who said I was interested in impressing men? *Grin* I kid, I like everything on the menu. And *Sniff* I lost my D100 many years ago, do you think there can still be love for me? Not with you, please let me be! I’m sorry, good sir, but your distinct lack of creativity is too much of a turn-off to consider the offer. Maybe up the ante next time? Heh. Be careful with what you ask for– you may end up getting it. Only if, together, you and he have five D20s. That’s true love right there.